What is Voice of One? 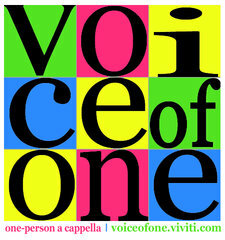 Voice of One is a project dedicated to showcasing the best in one "man" a cappella recordings. Inspired by Youtube artists like Sam Tsui and Kurt Hugo Schneider and Corey Vidal*, Vo1 targets a cappella music created by one voice with the effect of having a full group singing. Vo1 is in its beginning stages, but seeks to compile the best in one person a cappella (opac) recordings and release it as a digital album. *Although Vidal's video features himself as the "singer" of all parts, it was actually arranged and recorded by Moosebutter. Vidal is included because his video has sparked much interest and creation in the opac genre. From one of our favorites, Peter Hollens has done it again with his "Moves Like Jagger" cover featuring Savannah Outen. Lots of fun stuff going on, from his creative new set up (we especially love the snare bit), his funky tone with colors and outfits, and the overall goofy feeling of the video. We love the arrangement (Tom @ Random-Notes.com), the cinematography (Jimmy Bates @ on.fb.me/jimmy-bates-fifgen-films), and of course the voices of our stars. Anyway, check it out asap. Hollens is gettin' BIG and we couldn't be happier. Matt Mulholland, also a past featuree, brings us another fun one. An a cappella group favorite (seriously, everyone's done it or has wanted to), Matt takes us to that special place in our childhood and brings this Tarzan classic to opac. We appreciate the key change as well as Chimpy's return (admitting you have a problem is the first step). Enjoy! It's been a few weeks, and for that we apologize. Our time in Italy is coming to a close and we've been busy tying up loose ends. On a personal note, the Voca People will be in Rome tonight, which is a can't miss event. If you don't know who they are GO, RUN, NOW! You NEED to see what these guys (things?) do. Very excited about that. But BACK TO OPAC. After the first two seconds, we already knew we would like this video. Jeffrey Allen Scott does a very cool cover of Beat It. With his resonanting bass paired with his natural sound effects, this video is an awesome example of opac with minimal computer enhancement (comparatively). This is one opac we wish would last more than a verse and chorus! Jon Kosart (?) aka PAINT makes some cool/inventional(word? )/creative videos (see Paper Beat Box) (Also, Duet With Myself is pretty funny). The following video is fun, not too serious, and reminds us of The Donkey Wheel (see Knight's of Macedonia, scroll below). Bravo KosartMozart. We've found (as you probably will by browsing this site) that people LOVE covering Bruno Mars. His range is perfect for altos, tenors- really anyone looking to showcase their voice. Because there are so many Mars covers out there, it can become difficult to find the really exceptional ones. Gabe Klavun however, spends the time to make a solid cover (arrangement, vocals, editing) and succeeds. A pleasantly surprising find! Patrick van Slee & Matthew Gossage, 2002: We found this video in the vaults of Youtube (posted in the baby years of 2006) and we were both fascinated and entertained. So far the oldest youtube opac we've seen, this video proves a cappella multi-tracking has been around for a while. No promise on sonic treatment or visual pleasure, but it is a must see for all a cappella multi-tracking fans. Hipster to a new level. Paul Trinca brings us this viewer submitted video of Coldplay's Life in Technicolor ii. Using no absolutely no aut0-tuning, Trinca celebrates a cappella as it was meant to be- completely raw and natural. Very cool. Julien Neel: Finally, a little barbershop cover from an episode of the Simpsons. Julian has many barbershop covers, check out his channel to see! Courtney Woolsey- We were so excited to find Courtney (girl opac omg! ), but were sad once we realized a lot of her covers had some instrument in them or were older. So we said "Oh well!" and decided to feature her anyway. She's got one heck of a voice and needs to get big NOW. Please give her a watch. Ryan Narciso. His voice. It's like a soft, flowing tapestry that works beautifully as a soloist as well as a chorus of background singers. While his arrangement is simple, it lends to his vocal quality. However, upon further listening, you realize it's not that simple at all. He's got some interesting and wonderful chords in there. Also, the key changes are pretty cool. Del covers an opac favorite (we tend to see several songs with a bunch of covers), but does it with such a light carefreeness that you find you can listen to it one more time. Also, his intros give you a little insight into his sweet personality. Who could tire of Sam Tsui's voice? And even though this cover eventually has backing instrumentals, we can't thank Tsui and Schneider enough for inspiring many of the people who create OPAC today. And of course, the man who coined the phrase "Just Voice and Mouth", Mr. Mike Tompkins. We like this video because he provides insight on to how create your own opac! What do you think? Who has inspired your journey into opac loving? Brandon Toy was featured previously on our site, and brings us our first (and last?) cover of Rebecca Black's "Friday". It's actually quite good for the background and what he's done with an otherwise "unappreciated" song. We're not here to discuss politics- or the quality of non opac artists music- so we'll just say, we like what he's done with this song. Check itt. Feel good! Swoony! Upbeat! German! The words to describe André Fuckert's (real name) voice and cover. We were happy to pull this one out of the vaults of YouTube as it's over a year (gasp!) old and yet to be discovered by us (even though 54 thousand other people beat us to it). "The latest musical project, "Pray," consists of sounds entirely made by the voice and mouth. The arrangement (based on the Justin Bieber original) features Hollens, as well as Courtney Jensen and Therry Thomas, emerging artists who appeared with Hollens on NBC's "The Sing-Off." All proceeds from "Pray" will benefit victims of the March 2011 earthquake in Japan through the Red Cross. Peter Hollens and A Cappella Records are donating all proceeds, still working out if the publisher is willing to donate. Will update when I find out more!" So there you have it folks. Listen, purchase, and support the people fighting for their future in Japan. While the rest of the world has moved on, they are still in great need of help. Please, do this small gesture to show your concern for those that are grieving and struggling to move forward in light of everything. Taylor Hartwell, a newbie to the scene, but offering some pretty good arrangements and vocals to the opac community. At just 18 years old, Hartwell has begun arranging, creating, and producing covers of hit pop songs. Check out this short opac version of "Toxic". Mayk Eleinyel, another new guy from Spain creates some interesting opac in Spanish. If you're a speaker or just enjoy Spanish music, you will appreciate his covers. And even if you don't speak the language, you should watch his videos, as they are very well made- musically, and interesting to watch visually.